The name was born in a conversation between two of the founders, Franz Marc and Wassily Kandinsky. Kandinsky felt the color blue was spiritual and Marc believed animals had more of this spiritual connection in the natural world than humans…hence, Blue Rider. Blue Riders felt colors should be in harmony and resonate like music. 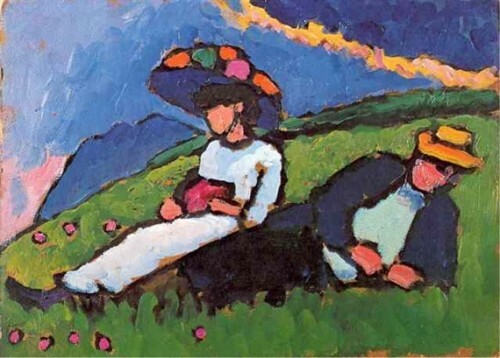 Gabriele Münter, also one of the founders of Blue Rider, collected children’s art. Although classically trained, she used simplified forms and colors expressing child-like innocence in her paintings. 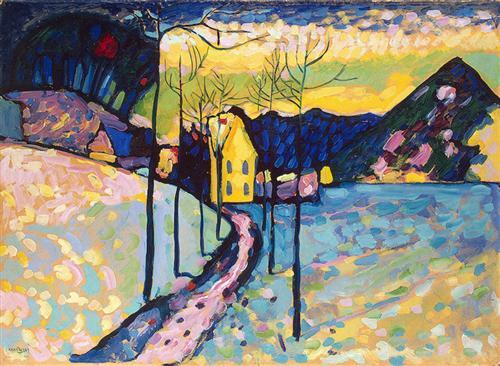 A passionate but devastating 12-year love affair developed between Gabriele Münter and Wassily Kandinsky…another story…stay tuned for the next blog post! 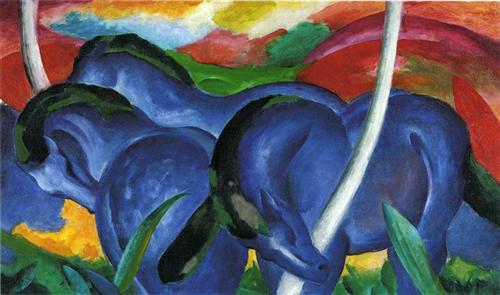 Blue Rider was disbanded with the onset of WWI and the tragic war death of Franz Marc. The small avant-garde group is considered to be fundamental to the German Expressionist movement. See Kandinsky’s greatest paintings. Click here if you are unable to view the video. More about Cornelia Feye, art historian and author, www.CorneliaFeye.wordpress.com. Brava, Cornelia! We’re fortunate to have such an erudite and sensitive scholar in our midst. Cornelia complements Kirby’s vision – and we hope for much more from both of them. Thank you for your kind comment. Coming from a successful art expert like yourself it is especially meaningful! Just a quick comment. People should know where to find the real art in your posts. Captions in particular should include the credit line for museum or the owner work. While many of the works I see you post are in the public domain use of the images is not an issue. But add the credit line and people where to find the originals. Lovely post! Looking forward to the next one about Munter and Kandinsky – I never knew about that! Thank you very much for sending me. I visit this museum every year, I visited where this group lived together in Murunao. This house belonged to Gabriele Munter. I love Blue Rider. I lived in Munich almost 40 years. I am going back to Munich every summer. My main house is Munich, beautiful city, art, music, fashion. A lot of rich people live there. The museum is renovated now. You should visit this museum and there are three big museums around. 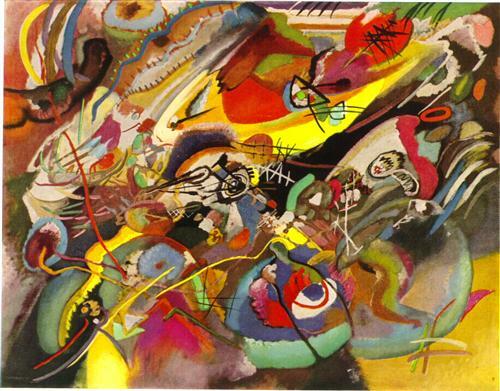 Kandinsky was certainly a passionate “colorist”. I’m looking forward to learning more about his passionate-but-doomed love affair w/ Miss Munster. Ah, “Life is such sweet sorrow”. Greetings from Santa Barbara. Thank you for the groovy art blog! Thanks, Kirby. I love the concept of “synaesthesist,” thinking of its many possible permutations as it pertains to reading and writing. And looking forward to Munter – I wonder if that which is thought “childlike” can also be interpreted as cutting to the essence (which, I suppose, children do better than the rest of us). Very nice, Kirby. I really enjoyed every bit of the information, the YouTube, the music, the visuals…Thank you!